I'm pretty sure I'd be dead if I had been in your shoes... that makes it hard to type so I'm glad I missed it and I appreciate that you take the time to share this with us. Perseverance results in success out of what seems surely to fail. It’s a miracle that I ever arrive at the right spot. No, seriously, I’m an excellent navigator. Just don’t ask me to write anything down. We’re on the road home today. I’m pretty sure we’re headed to Dallas. It’s down I-25, right? Thoroughly enjoyed reading your report, HMoD! I can see the Fletcher influence not only in your prose, but in your mode of travel and your philosophy as well, I think. My thoughts exactly, very Fletcheresque! Your cursing in the rain moment reminds me of the rain scene in Cool Hand Luke! And THAT is why I still carry a free standing tent! I am not worthy to tie Fletcher's boots, or Cool Hand Luke's, but I am grateful for the comparison. If I have a talent, it is to make failure interesting. I woke up around 7am, hands still clutching the handles of my trekking poles, eyes skyward toward the apex of my Silshelter. The first thing I noticed was the sound, or lack thereof: absolute silence all around me. No rain, no wind. Thank god, I thought to myself, the rain really did blow itself out last night. As best as I could remember, it had stopped around 4am, and shortly after that I’d fallen asleep….so I’d probably gotten about three hours sleep. The second thing I noticed was that it was cold. Really cold. I figured it was below freezing for sure. I’d pull out my thermometer in a second and check. The third thing I noticed, as I lay there, staring up at the apex of my tent, was that the light was very gray. It was most definitely NOT a sunny dawn. I decided to take a peek. I relaxed my grip on my trekking poles and rolled over onto my shoulder in order to peel back one of my tarptent’s entrance flaps. I stopped short, mouth agape. And then moaned. A low, pained moan that slowly turned into a fatalistic chuckle. “You’ve got to be kidding,” I said to no one. My tent was buried in snow. The storm hadn’t ended at 4am. The pounding rain had simply changed to silent snow as the temperatures fell below freezing. I was buried under six inches of snow; drifts up to a foot or more. No wonder I was shivering and shaking last night. If it felt like 20 degrees inside my tent, what was it like outside? I fished around for my tiny thermometer, unhooked it from its zipper pull, and pushed it under my tent wall, through the snow drift, and up onto the surface outside. I never saw it again. Apparently, it melted into the deep drift and sank to the bottom. I searched and searched later, but it was just gone. “A chance of rain,” I murmured, and shook my head. My clothes were wet from last night’s struggles. Overnight, my body heat had only dried them a little. My down bag was wet, too. I was shivering, on the edge of hypothermia. With teeth gritted against the cold, I stripped down and tossed my wet inner layer of hiking clothes aside, re-donned my fleece layers and my other pair of (slightly drier) hiking socks, adding my down jacket and microfleece balaclava on top of it all. Then I forced myself to eat two caffeinated GU gels and drink several ounces of water. Next I slipped on my sodden raingear and my (still dry) boots. I cinched the raincoat’s hood tight around my face and placed my hat on top of it. Lastly, I pulled on my cold, soaking-wet paddling gloves, wincing at the feel of them on my already freezing hands. I sorted through everything still in my tent and packed it all into my backpack, and then opened up my tent flaps and stepped outside. It was a genuine winter wonderland. Gorgeous. The narrow little canyon I’d camped in last night was now all snow and no rock. Every single surface was white. Vegetation, too. It was all buried under a thick blanket of snow, and it was still snowing. Big fat flakes floating gently down through the air. I wish I’d had a real camera with me. I wish I’d had time to take better pictures. But all I had was my old iPhone and numb fingers. I took one quick shot, just for the record, and then struck camp. Down came my tent, and into my packbag. Took me a minute to find my packrafting gear: it was completely buried under a snowdrift. I dug it out with my fingers, shook as much snow off the pieces as I could, and then loaded it all onto my backpack. I hoisted my pack – now weighing around 33lbs – onto my shoulders and grabbed my trekking poles. I paused a minute to take one last leisurely look around at the rare snowy scene, and then turned my cold, soggy self downcanyon. My goal for tonight was many miles away - the area below the ghost town of La Noria – a full two miles on the other side of Ernst Tinaja, my next water source. With the snow coming down hard now, my world was limited to the few feet in front of me and the next few steps. I had no sense of a larger picture, but someone else did: a few miles away, another BBC user, Jonathan Sadow, had wisely abandoned his plans to hike into Ernst Basin from Willow Tank on the Old Ore Road and was heading out of the park toward Terlingua. He stopped to snap this picture of the Deadhorse Mountains, which he later gave me permission to post here. I'm somewhere on the other side of that ridge, desperately hoping to make it up and over and into the desert before nightfall. I had no way of knowing if the snow would end today, or tomorrow, or even later. I thought it would end by tomorrow morning, but who knew? My original plan had been to make my way to the tinaja by downclimbing through its canyon, but that didn’t seem wise now, or perhaps even possible in snow like this. So I’d have to climb up and over the slopes of the Cuesta Carlota just south of Ernst Tinaja canyon. But first I had to get there, and that meant seven miles of hiking through the cold snow to the Cuesta, beginning with the canyon I was in now. The canyon floor was choked with boulders. Threading my way through and over them in the snow was substantially more difficult than in dry weather. Not only was the footing occasionally slippery, but it was uncertain: both the boulders and the plants growing between them were covered with the same thick blanket of powdery snow. It was hard to tell where rock ended and vegetation began. I was tired. I was sleep-deprived. I was cold and wet and shivering: probably borderline hypothermic. Most of all, I was in a hurry. I wanted to at least get into the open desert on the other side of Ernst Tinaja before night fell. I reached a choke point in the canyon. A jumble of boulders blocked the way, forcing me to climb up a series of ever larger rocks, using my trekking poles to steady me on the slippery powder. Topping out and coming down the other side of the maze of rocks, I took a long unprotected step down onto a flat, snow-covered boulder. The boulder turned out to be a creosote bush, and my left foot plunged through it. Instantly, I was wildly off-balance. My foot hit solid rock some two feet lower than I’d expected. My backpack, though it only weighed 33lbs was unwieldy and top-heavy with all the attached packrafting gear. My center of gravity being higher than usual, I stumbled heavily and was tossed forward over the boulders into a five foot freefall, twisting to my right as I fell. The next thing I remember was laying flat on my back, gasping for breath. I’m not sure exactly what happened, but this is what I think happened: I flipped, heels over head, while my left leg caught between two boulders. I landed head first and probably avoided a concussion because my packrafting gear (paddle shafts and raft) hit first and took the brunt of the impact. Meanwhile, my left leg, which was lodged between two rocks, was wrenched as it was pulled free. I lay there, breathless in the snow, trying to assess any damage I might have suffered. I didn’t feel any blood oozing, no broken bones or particularly excruciating pains, but my left knee ached, and pretty badly. This was the same knee that had given me so much trouble earlier in the year after my last cross-park attempt. What a pisser…up to now the knee had been absolutely fine, no pain or weakness at all. Over the previous three days, I’d hiked almost 18 essentially off-trail miles, ascended 3500 feet and descended 1200 feet, in good weather and in bad, while carrying a pack weighing anywhere from 36lbs to 56lbs, and had zero knee problems. And now this: a simple stupid mistake in the snow. I rolled over slowly and pulled myself to my feet. I put weight on my knee. It held, but it was throbbing now. I looked around to see if I’d lost anything in the tumble. I had: my hat and one SmartWater bottle, which I retrieved. Everything else seemed to be intact, including my glasses and even my two trekking poles, the straps of which – weirdly – had never slipped off my wrists. It’s a wonder the poles didn’t break, or break me. I took off my pack and inspected it and the gear strapped to it. Looked OK, though who knew with the raft? I felt around my body, just to make sure. I had a small lump on my head, one shoulder and armpit were extremely sore, and my knee hurt. Digging through my pack’s top pocket, I extracted my medical kit, fished out my pill box, and took two ibuprofen. It occurred to me that this was an awfully lot like the tumble I took when I hurriedly bailed off of the Sue Peaks ridge last December. What was the deal with the Deadhorse and me? It was still snowing and I still had almost 9 miles to cover before nightfall, so I shouldered my pack and headed south again, this time a little more carefully. I made it through the short canyon and then swung southwest close to the base of the Alto Relex, moving fairly smoothly, if slowly, on my uncertain knee, through open washes. The knee hurt, but dully rather than sharply, and I took that as a good sign. Almost two miles later, I limped, rather than walked, into Passionflower Canyon, the second of the basin’s two little jewels, and my favorite. It was still snowing, harder now, and the northeast wind had returned, gently at first, but now with increasing power, as I moved through the narrow, twisting canyon. I paused in one of the most beautiful sections of the canyon – a place special to me – to sit and eat a KIND bar and some jerky, and drink a half-liter of water. I zipped-up against the wind and turned my face downcanyon to avoid the windburn. I admired the stark beauty of the canyon and thought about its isolation and loneliness. I watched the heavy snowflakes fall slowly to the ground, some landing on my arms and ceasing to exist, other joining their companions on the ground in a thick cold blanket. And just then I had an odd, but unshakeable sense of not being alone. I’d had this feeling once or twice before in the Bend, way out in the middle of nowhere. It never came to anything, and I’d never made sense of it. I shook it off and considered my knee: it was not getting better and it was probably getting worse. The other aches and pains from the tumble were minor, but the knee bore watching. Again, I reflected on the irony of making it this far – fifteen days – without serious injury, only to mess myself up in a stupid, self-inflicted fall. A mile or more later, around 11 am, I emerged, limping, from the mouth of the beautiful canyon, passed the terminus of the Alto Relex, and entered into the broad, majestic two-mile-wide expanse of the full Ernst Basin. I set my sights on the Cuesta Carlota and the distant gash of Ernst Tinaja Canyon, three-and-a-half miles distant. For the next three hours, I meandered my way south through the braided washes of the basin. I’d like to report that my knee pain grew progressively less and my hiking progressively stronger, but neither did. I slogged my way through the snowfall, using my trekking poles to favor my knee. The more the wind blew – and boy did it blow – the more I felt the dampness of the my still-wet fleece under my raingear. Moving helped me keep hypothermia at bay, but I always felt it was juuuuuusst around the corner. I didn’t know exactly what temperature it was – my tiny thermometer was buried somewhere in the snow at the other end of the basin – but it was damned cold (rangers would later tell me it was probably in the high teens or low twenties in the Ernst Basin that day). I passed Tinaja Verde, far to my left, buried deep and high in the imposing ridge that forms the eastern border of the basin. I’d originally planned on taking a side trip to investigate it, but not today, not with this knee, which now felt slightly swollen and tender and ached with every step. Today, I was focused on making it to the certainty of Ernst Tinaja Canyon where I would refill my water supply for the next leg of my trip. My on-hand water supply was down to a single full 1-liter Smartwater bottle, and a few ounces in one of my Dromlite bladders. Ernst Tinaja Canyon is visible and identifiable from a long, long ways up the Ernst Basin. My march toward it utterly lacked drama – just an interminable, slow, mostly painful slog through wind and snow and cold. But I did it, and sometime shortly before 3pm, I pulled up to the northernmost of the two entrances to the canyon and headed inside, between its dark looming walls. I quickly reached the point where the other, southern, entrance joined the main canyon. The southern path was the route to the rough trail up and over the Cuesta Carlota and into the western desert beyond. There, at the intersection, I left my backpack (now weighing about 28lbs) under the falling snow and headed downcanyon with my empty 6-liter Dromlite water bladder. That bladder, when filled – along with the 1.25 liters now in my Smartwater bottles – would last me all the way to my next food cache near Mile 13 of the park road, and then on to the reliable water of Glenn Springs in the desert far to the southwest, a day-and-a-half from now. Given the weather and my knee, the likelihood of me actually reaching the big tinaja was zilch, but there were plenty of smaller tinajas upcanyon of the big one; they would certainly have water enough for me in them. I limped slowly down the narrowing canyon, gingerly making my way across snow-covered slickrock and through deep, soft gravels and sand. Small pools of water, an inch or two deep, most with rimes of frost or ice, appeared almost immediately but I was hoping for something a little deeper, something from which I could more easily fill my Dromlite bag without stirring up too much silt. In normal circumstances I would simply hike down to the biggest, deepest pool that I could easily reach, tie my utility cord to my collapsible water bucket, throw it in, and then haul it up full of four or five liters of water which I would then filter into my Dromlite using a bandanna as a strainer. But I’d lost that water bucket into the Rio Grande way back on Day Four on the river. I was improvising here. I soon found a deeper pool, more suitable for my Dromlite. I broke through the thin layer of ice on top, and dipped my Dromlite into the mostly clear water below. One liter, two liters, three…and then I stopped. Was I really going to do this? Was I going to hike another nine days and 90+ miles over the badlands, across the eastern desert, through the Quemadas, past the Chimneys, down to the Mesa de Anguila, and up and over all the way to my vehicle in Lajitas – with THIS knee? If so, then I needed to fill this Dromlite bladder to the brim and load it back onto my pack, bringing the weight to almost 40 pounds, and take the steep trail over the Cuesta Carlota to La Noria, and reach it before sunset. If not, I could stop now – because this was more than enough water to get me to my next food cache, hidden in the desert near Mile 13 on the park road south of Panther Junction. That was where I was supposed to leave my packrafting gear tomorrow morning, so that Mule Ears and his friend Scott could retrieve and stow it (along with my empty Bear Vault cache) by noon, a day before beginning their own long backpacking trip into the Quemadas. I wasn’t supposed to meet them there, I was supposed to be deep in the desert by the time they arrived to retrieve my stuff. But we had all planned to rendezvous two days later, along the Fresno Creek drainage, for dinner and a shared campsite. And then to reunite again several days later in Terlingua when we finished each of our trips on the same afternoon. But....a thought grew in my mind....I could hike out to that cache tomorrow morning....as long as I reached it by noon....and stay there, waiting for them to arrive. And, yet...Mule Ears had gone over and above in so many ways to help make my trip this year a reality, and abandoning it now would be a very poor way to repay him for all his kindness and effort. Still, from what I had gleaned of him, I was pretty sure that if I asked, he’d drive me back to my vehicle in Lajitas tomorrow. I knelt there at the icy tinaja in silence for a long, long minute, the bladder gripped tightly in my hands in front of me, snowflakes falling softly against my forearms and melting into nothingness as if they’d never even existed. And then...I poured a liter of water slowly, sadly out of my Dromlite and back to where it came from. I was done. Heading out of the canyon, pack on my back, I turned south into the Ernst Basin, looking for the cairns that would lead me to the rough trail up the Cuesta Carlota. It was 3:30pm. Outside the canyon, in the wide open basin, the wind was blowing ferociously, from both the north and the east. Snow was whipping through the air and stinging my face. I don’t know what the temperature was but it felt like 25 degrees. The wind chill was ghastly. With a bit of searching I found the trail up the cuesta and started up, fighting the wind all the way. Mostly it was at my back, but that didn’t help much: every gale-force gust threatened to topple me over forward. I was already using my trekking poles to steady my knee. Adding an argumentative wind into the equation wasn’t helping matters. The higher I climbed, the more ferocious the wind became. There were times when the trail bent north and the full force of the wind would bring me to a standstill, even forcing me backward. Twice it knocked me clean over: once when it came from the north, and another coming from the east. Each time, I picked myself up slowly, checked my knee and my pack, and continued plodding forward. Reaching the top of the cuesta, I found a moment’s shelter in a small alcove of rock and took in my surroundings. Finally, for the first time during my fifteen days, I could see the breathtaking broad central desert of Big Bend stretching out westward before me for almost a hundred miles. Far to the northwest, I could also see the Chisos once again and, to the south, Chilicotal and Talley Mountains. All were bleached with snow, the Chisos by far the heaviest, from top to bottom. Even the low desert had dustings. Between me and the desert stretched the drainage of Tornillo Creek, and the clayey badlands reaching all the way from the Old Ore Road to the unseen park road, beyond which my cache awaited. In Mexico, to the south, the Sierra del Carmen were as white as ghosts. Behind me, to the east, lay the broad graben of Ernst Basin. The Deadhorse Mountains, rank upon rank stretching eastward, were completely buried beneath deep snow and, below me, snow was still falling on the Ernst Basin in windswept eddies, slowly coating its vast flat expanse with a white blanket that made the wide basin seem even more featureless than usual. The gray skies, cold wind, and white snow matched my mood. My trip was over; my hopes dashed again, another rare opportunity frittered away. So many people had made so many sacrifices to help me get here, and the best I could do was get even less far than last year. I had failed. Again. Clearly, the Deadhorse Mountains were the graveyard of my hopes and dreams. This was where they went to die. I pondered this thought: in a moment, I would turn away to the west, toward the oncoming sunset, hike down off the cuesta to the desert below, away from my now-dead hopes, and make camp for the night somewhere close to the little ghost town of La Noria and its scattered but still-tended graves. A place where people, much stronger than me, had struggled to fulfill their own hopes and dreams and ultimately surrendered to failure. Behind me, on the other side of the cuesta, I would leave behind an old ore operation of unimaginable labor, now obsolete, and an ancient telephone line strung by nominally American soldiers only slightly removed from the War Between the States, stationed so far from home, and a cave where early Big Bend pioneers had carved out a home, every one struggling to establish a life in this brutal, inhospitable corner of the world. I would leave behind a river run first by the Skiles and the DuPonts, a memorial to a dead NPS volunteer hidden deep in a lonely remote canyon, a riverside military camp lost to time, multiple paleo-Indian campsites, metates of aboriginal Indians who slowly ground grain here several thousand years ago, petroglyphs and pictographs and worked stones that hid more mysteries than they revealed, the ghosts of Jumano and Apache and Comanche Indians who learned to live in and on this land with few tools but a great deal of wisdom, distant echoes of jacals and vegas of Hispanic farmers past, peasants who labored under Aztec then Spanish then French then Mexican then Texan then American rule while hardly changing their lifestyles over centuries, and the fences and windmills and corrals of the nineteenth-century homesteads of the Adams, the Rooneys, the Dorgans, the Subletts, the Dodsons, the Wilsons, and the hundreds of hard ranch hands in their employ, the barely discernible echoes of two wars with Mexico and another two involving the entire world, and glimpses - real and imagined - of the horses and burros and mules and men and women and children starving in the desert as they yearned their way through lands first explored by companions of de la Vaca, and Coronado, and Onate. All of them – every one – now dead and gone or soon to be. Not unlike an unfortunate kitten named Olivia Felix, whose full story, in all its complexity, I would never really know: neither its beginning nor its end. I sighed, surrendered, and turned west, heading down through the snowy landscape to my final camp in the desert. As I did – perhaps because I am from Irish stock – I heard the words of James Joyce’s The Dead in my mind…. House, I get how this feels like failure. But I doubt anyone reading this sees it as anything less than a phenomenal accomplishment. For two years you've had your sights set on one particular type of hike, the cross-the-park hike, established back in the day when the eastern end of Telephone Canyon was accessible. And though you haven't (yet) made that happen, you've invented your own brand of trek, the Round the Bender: start somewhere along the park boundary, veer in a broad arc, and don't stop until something runs out, be it a knee or days on the permit. Simply remarkable. Inline with DSR...regardless of its conclusion - yours is a triumph of design, ingenuity, perseverance, utter ballsiness and literature for that matter. The hike down the other side of Cuesta Carlota had actually been mercifully easy. My knee still ached, but as I descended the cuesta’s west side, the big bulk of the ridge acted as a windbreak against the northeast wind, freeing me from the terrible pummeling I’d taken during the ascent up the other side. The snow, too, was much less on this side. Just a light shower of snowflakes. Amazing that a single ridge could make this much difference. I would later read, in an obscure academic treatise, that the Deadhorse Mountains are notorious for making their own weather. If it’s bad in the Chisos, it’ll be even worse in the Deadhorse. Sometimes it’ll be bad in the Deadhorse even when it’s beautiful everywhere else. Making my way down the trail on the west side of the cuesta, I could see the Old Ore Road in the distance. Before reaching it, but now in the desert, I turned west and headed toward La Noria. The snow may have lessened, but the cold had not. It was bitterly, bitterly cold. And once I put some distance between me and the cuesta, the wind returned. I can only imagine what the windchill must have been out here in the open desert with little or nothing to stop the wind. The ache in my knee grew worse. A bit later, I felt a popping with each bend of the knee: the same popping I’d felt back in March when the knee first started acting up. I stopped and took another two ibuprofen, pulled up the leg of my fleece pants, and wrapped an ace bandage around the knee. Most of the afternoon, I’d been wearing a special patellar strap recommended to me by DesertRatShorty, but now I was needing even more support. Before resuming my hike, I pondered my route. I was heading to La Noria mostly for sentimental reasons. I wanted to visit the old graves there, and look around the abandoned townsite up on the ridge. It was part of my interest in the old military campsites that were created to manage the cross-border chaos resulting from the Mexican Revolution. But the cache I would be heading for in the morning - under some deadline pressure if I wanted to arrive before Mule Ears and Scott - was in a slightly different direction, some forty or forty-five degrees to the southwest. Proceeding to the graves and to La Noria would only cost me time tomorrow – time I might not have if I wanted to rendezvous with Mule Ears and Scott. I wasn’t sure how fast I’d be able to hike tomorrow, given the state of my knee. And who knew what kind of weather I’d have? I suspected clear, but the last few days gave me pause. So, instead of proceeding west to the graves around La Noria, I turned and headed southwest across the Old Ore Road and into the desert. I wouldn’t have made it to La Noria that afternoon anyway. Before I’d covered even another half-mile, the sun began to drop below Chilicotal Mountain. The gray clouds made it seem even darker and later than it was. I stopped there, on a rise a half mile on the other side of the Old Ore Road, and made camp in a small clearing between several cacti and creosote. The snow had stopped but the wind most definitely had not. Fortunately, the substrate was good up on this hill. With some difficulty, I pitched my Silshelter in the screaming wind and liberally applied all the rocks I could find (not many) to my stakepoints. I made sure to pitch the shelter so that its low end was facing northeast, into the wind, and I inverted my trekking poles as I’d learned to do back in the Ernst Basin canyon. I wanted a good night’s sleep. I pulled my still-wet hiking clothes out of my backpack and laid them out inside the tent to dry. Then I spread out my bedroll, took off my boots, slipped off my ace bandage and back into my down vest and microfleece balaclava, and climbed in to my bag, still wearing my damp fleece next to my skin. I heated up a very welcome hot meal and ate it from inside my sleeping bag, chasing it down with a dessert of ibuprofen and several ounces of very cold water. When I finally cinched my sleeping bag up tight that night and lay down inside the cold, pitch-black darkness of my Silshelter, I was as tired and dispirited as I’ve ever been while in the wilderness. That night, I slept like the proverbial rock. The only negative was that I awoke once with terrible hamstring cramps in my left thigh. I dug out my NUUN tablets, made myself a quick drink and washed down another two ibuprofen. Eventually the cramps ceased and I fell back into a deep, deep sleep. A few hours later I woke up to bright sunshine filtering through the walls of my Silshelter. It was 7:30am. I stuck my head outside the shelter and saw brilliantly blue, cloudless skies without a hint of wind. The weather HAD cleared. But man, oh man, was it cold. Knowing I had no time to waste if I wanted to rendezvous with Mule Ears and Scott, I reached for my boots. They were covered in thick ice. INSIDE my tent. I looked over at my Smartwater bottle: frozen. I reached for my hiking clothes, laid out to dry inside the tent last night: frozen solid. If it had been cold two nights ago, it was REALLY cold last night. Probably in the low teens. Oddly, I slept great, even on my one, single, insufficient groundpad. Then again, I wasn’t sleeping in soaking-wet clothes, as I had a couple nights ago. The fleece I had on now was completely dry: the body heat in my sleeping bag had dried it overnight. The socks on my feet, too. I was already wearing all my available dry clothes, so I crawled out of my bag. I broke the ice off my boots, slipped them on, and exited the tent. It was a gorgeous, gorgeous morning. Had I not been injured, I would have thought it a perfect morning. The sky was blue in the way it can only be after a hellacious storm clears. 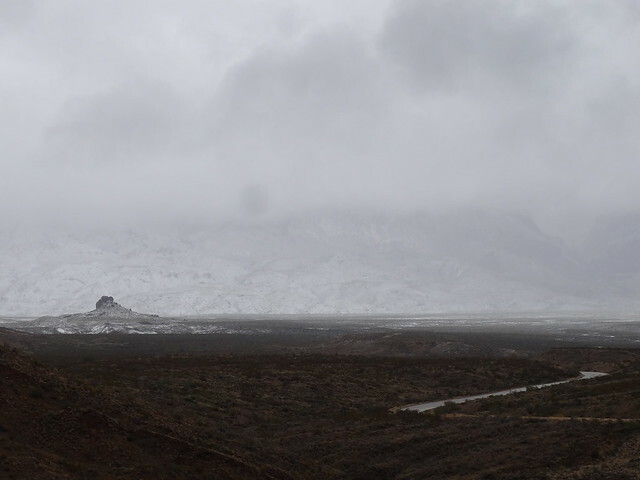 Far across the desert to the northwest, I could see the Chisos Mountains rising from the desert, still covered in snow, and with mists circling their middle elevations. Chilicotal and Talley were mostly snow-free. The Deadhorse were barely visible behind the slopes of the Cuesta Carlota - and further south the Alto Relex - and still buried under blinding white snow. I reached inside my tent and pulled out my hiking clothes, every piece of which felt like cheap card stock. My shirt and pants and socks and hat were frozen so solidly that I was afraid I might break them in to pieces if I treated them too roughly. I laid each carefully out on top of creosote and cholla, tilting them toward the rising sun. I’d let them thaw there. Then I pulled out my down sleeping bag, coated thickly with frost, and laid it across a creosote bush to dry. I sat down on a rock to wait for the sun to do its work. Looking at my clothes, their stiff frozen limbs jutting out at odd, unnatural, even painful angles, it occurred to me that they looked remarkably like photographs of the dead, frozen bodies at the massacre at Wounded Knee, or perhaps like Otzi the Iceman, the Neolithic adventurer whose ancient but still-preserved body was retrieved frozen from an alpine glacier in Italy. These were creepy thoughts. After forty-five minutes or so, my clothes were completely dry – as good as new, if new includes filthy – and I added them underneath my fleece. Thusly, layered, I put my down vest into my now-packed backpack and made ready to head southwestward toward the park road and my cache. Again, I have to say that the weather was just perfect. The temperatures were warming very quickly. The sky was unbelievably blue. The air was clean and clear as crystal. Even the ground was firm, despite the days of rain and snow. If there’s one surface I absolutely loathe hiking on, it’s wet, sticky Bentonite clay. But I encountered very little this day. Last year, during my first attempt at a cross-park hike, I’d traveled much the same route: from Ernst Tinaja to Mile Marker 12 on the main park road. I’d chosen a reasonably intelligent route without too many ups and downs through the badlands, but this year I felt I could do better. And I have to say, I did. Worried about my knee, I kept the ups and down to a minimum and played the topo lines like a virtuoso. My elevation gains and losses were about as few as possible. The only hiccup occurred in the form of a wide, deep Mesquite and Acacia belt stretching across part of the Tornillo Creek drainage from north to south. I hit it at what looked like the middle, making a circumvention look long and unappealing, so in I went, and forced my way through about 50 yards of thorns and branches. I winced every time I snagged, certain I’d just destroyed the packraft strapped to the outside of my packbag. But now was not the time for second guesses – I had a hard deadline to meet: noon at the cache, or I was toast. l didn't know exactIy when Mule Ears and Scott would arrive to retrieve my packraft, but I couldn't afford to be late. I did NOT want to try to hitchhike back to Panther Junction and then pay someone to shuttle me to my vehicle in Lajitas. It would be aggravating, costly, and humiliating. I was already carrying a year’s worth of humiliation on my back and I didn’t need one ounce more. Limping gingerly, I pressed on, always on the lookout for a few key landmarks: a wide north-south wash with oddly-humming telephone lines passing through from horizon to horizon from Panther Junction to Rio Grande Village; an abrupt rank of steep, gravelly hills ending in a long, long, long, flat, north-south mesa and, from beyond the mesa, the strange, thrumming, and alien sound of rubber on asphalt: the park road. I stepped onto the weirdly firm surface of the park road at 11:55. Two hundred yards north of Mile Marker 13. For the second year in a row, I’d nailed it: ten miles of trailless cross-country traffic through a maze of bewildering hills and washes and thorny plants, and I’d only deviated from my goal by a few hundred feet. And for the second year in a row, I experienced an unnerving, uncomfortable sense of vertigo when my feet hit the asphalt…or maybe when I peered up and down the unnaturally straight and well-manicured ribbon of industrial road. It just…didn’t…seem right. In any sense of the word. I stumbled across the asphalt – my feet actually felt repelled by the smooth, hard, oily surface – and into the desert on the other side. Ten minutes later, I approached the location where I’d left my cache, fifty or so yards off the main road. Over the years, I’ve always wondered if the cache is actually going to be there. Did someone – an interloper, another hiker, a ranger – take it way? Or was it mauled by an animal, or a flood, or the wind? Fortunately, my caches have always been exactly where I left them, but the consequences of failure are fairly severe, so I always worry. But there it was, my Bear Vault 500, exactly where I’d placed it eighteen days ago, behind a tall stand of creosote on the edge of a shallow wash, tucked away in its black stuffsack with my name and trip dates on it. I was delighted. And then, almost simultaneously, I was heartbroken. This cache represented the next six days of my intended trip: from the park road to Point 2417 to the ghost town of Glenn Springs to the Fresno Drainage and my camp with Mule Ears and Scott, to Double Spring and Fisk Canyon, to the abandoned homestead at Dominguez Spring and on to the Mule Ears, and to my final cache near the Ross Maxwell Scenic Drive. From there I’d have gone on to the petroglyphs of The Chimneys and the Geminid Meteor Shower, to Bee Spring, Pena Spring, Gomez Spring and the ghost town of Terlingua Abajo, then up the Mesa de Anguila, and finally to my vehicle at the trailhead in Lajitas. But none of that was to be. Instead of nine more days on foot through Big Bend, I would spend the next nine minutes (or maybe ninety) waiting for Mule Ears and Scott to arrive. They’d park on the side of the road, step out of their rental car, follow my emailed directions to the hidden cache and find me sitting here on top of it. And I’d explain that my trip was finished, over, done. So I sat down on my upturned Bear Vault, screened from the road by the tall creosote wall, comfortable in the sunny 40-something-degree weather. I swallowed a couple of ibuprofen, pulled out my little Rite-in-the-Rain journal, and my ridiculously tiny blue pen, and began to write this trip report. How could I possibly make sense of it all: my failed cross-park hike last year and how it led to this year’s attempt, all the research and planning, finding and acquiring and testing the packraft, the park regulations, the consultation with rangers and ex-rangers, mapping my routes and caches, all the encouragement and help from so many kind people, the insanity of boating the Rio Grande from one end of the park to the other on a packraft I barely knew how to maneuver, the dangers, the beauties, the tragic encounter with the kitten, the coincidental meeting with Slimkitty in Rio Grande Village, all the other wonderful and kind folks I met there, the many rapids of the river, the history of the land and the history of the water, the tensions between the US and Mexico, the candelilla harvesters and the drug runners, the maddening Giant River Cane, the hiking with a full packrafting kit on my back, the awe-inspiring canyons of the river, the awe-inspiring canyons of the land, again the crazy weather, more injuries, the many challenges and my responses, and…then again, above all…the kitten. “The most important thing you need to know about this trip is that I killed a cat in cold blood by the side of the river. That overshadows everything. I was still scribbling away when I heard a vehicle pull over to the side of the road some fifty yards away. Two doors opened and shut. Voices, and then footsteps. As the footsteps crunched across the desert toward my seat in the wash, behind the tall creosote, I began to make out individual words in their conversation: they were repeating the directions to my cache, the ones I’d emailed to Mule Ears. Two tall men appeared at the side of a scraggly ocotillo with an old rusted can stuck between its stalks: one of the waypoints to my cache. I could see the men clearly now, twenty feet away. Scott turned in the direction of the cache and saw me sitting there behind the creosote, smiling. As I stood up, we all recognized each other from our pictures in trip reports. Mule Ears, who had played such a large part in the planning of this trip, strode over, beaming, to shake my hand, as did Scott. And then I told them why I was still here at my cache. Shock, and sadness, all around. Some awkward shuffling. Mule Ears, stricken, was about to give me a consoling hug, but I deflected it: I would have broken out in tears and I wasn't ready to do that. “Well, what now?” he asked, sadly but sympathetically.